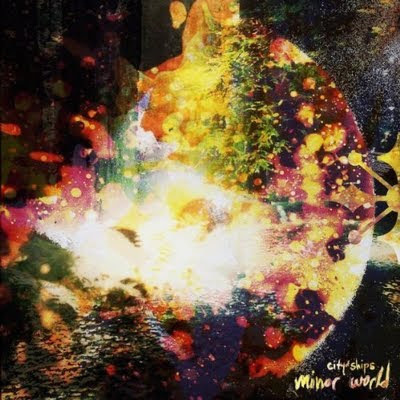 Heavy Planet : Album Review: City of Ships - "Minor World"
Album Review: City of Ships - "Minor World"
The principle I carry when determining whether or not a band qualifies as "heavy" is a pretty simple one; somehow, make me FEEL what I'm hearing. Anyone can learn a few chords and spit 80's rock, anyone can buy a "how-to" video on just about anything to do with getting your band heard. You don't have to be proficient musicians, necessarily. You don't have to hit "puree" on the distortion. You don't even need to be that loud. Just believe that what you're creating will slug someone in the gut, one way or another. City of Ships strikes the heavy on too many levels to enumerate. This is a smart band, this is a heavy band, and this is a beautiful band. The fuzz on this record exceeds the minimum standard, while expanding components move far-beyond expectations. Good thing, too; if I'd abandoned this record too soon, I'd have missed out on ten spacey slices of hazy insomnia. On Minor World, this trio manages to deliver an effort of staggering thickness, congenial sadness, and wandering cosmic acceptance. The guitars here will fool you. Clotilde begins with a gentle Silent Lucidity lilt, but thickness follows close. There's enough dirty mist to effectively balance the clean musicianship. Dryer lint knocks at the door through the song's first half before busting through with floating, spritzing, warbling gamma rays. Slowly, the track steps away and fades out of range. Subrosa fully establishes the album's lingering sadness, paired with jagged guitars, furry hooks, and yelps that neither take over nor drown in the marriage of prog guitar and solid bass-bounce. Tantric Engineer is hazy complacency, though Rob Motes's jackhammer drums steal the show without apology. The guitars may sound like Incubus, if Incubus weren't pretty and self-absorbed. Andrew Jernigan's bass contains a doomy drop before the song hightails it to space. City of Ships excel when they pull back. Darkness at Noon is the album's standout. Sad, pensive, and incredibly haunting, this is a song you'll play on your way to a November funeral. Elements blend, lift, drop, and eventually stagger drunk. The sounds are coddled just long enough to relax the listener before letting him go. Where Deftones never quite relent, City of Ships knows just where to keep things at a low hum. Oh, and speaking of Hum, I can only imagine Matt Talbot is somewhere leading a classroom where this album is the curriculum's cornerstone. Eric Jernigan's crippling howl is the bridge between the creator and the listener. You'll feel what he's feeling, canvassed by intertwining instruments that never stumble over one another (evidenced on Low Countries). The vocals layer themselves, minimizing the isolation the lyrics are delivering. Celestial Navigation is punky, emotional tickling until rhythms shift and an alien delivers your crunchy takeout. Eric's guitars are sharp as cliff rocks, but his voice cuts deeper than obsidian. Easy Way/Hard Way showcases a sludge grind on bass, while the band's expansive vocabulary is buried in beautiful lyrics like "Why is it that the addicts are the only ones who got it figured out?" Chainman is heavy and can't seem to decide if it wants to embrace the listener or turn and walk away. The bass keeps slummin' while the guitar is climbing peaks. Again, this band knows how to contrast elements and still keep things steady. The album ends as it began, with Low Lives bringing hope's bare minimum before quickly pulling back and leaving your hand empty. The clickety-clack drums, moon-trip guitars, and distant screeches break into sludge thumps and fadeout fuzz before everything reaches an abrupt conclusion. City of Ships will leave you with countless questions. You're gonna fall asleep thinking about this sound and about this band. The real kicker, though, is the uncertainty of whether or not they'll ever love you as much as you love them. This album is evanescent. You'll think this is a two-way street, you'll buzz from the stomach-pit butterflies, and then you'll have the rug pulled out from under you. But, of course... you'll go back for more. Stream the entire album's brilliance here.